Sphatik or Quartz crystal is a gift of nature and is an excellent conductor of energy. 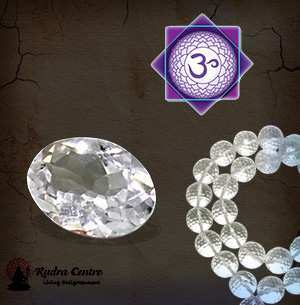 Sphatik is a power stone that amplifies and transmits the energy that it absorbs. It is also a cleansing crystal as it absorbs vibrations from the surroundings; hence negative energies are replaced with positivity and ensure the spiritual, psychological and physical wellbeing of a human being. Because of this quality it is used in the many spiritual products such as pyramids, lingams, Shree Yantra, rosaries, God and Goddesses Idols etc. 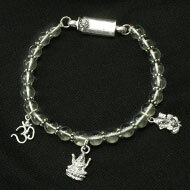 Using a rosary made from Sphatik crystal gives concentration, cools the body, and calms the mind. Wearing a crystal mala ensures a sound and undisturbed sleep. 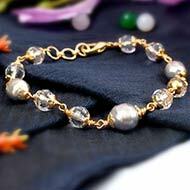 Crystal rosaries (mala) are used to count mantras while worshipping Lakshmi, Durga, Saraswati and other Goddesses. The spiritual powers in Quartz gems have been propagated by gem therapists as these gems create an electrochemical balance in the body thus dispelling anxiety and negativity from an individual. Sphatik is also known as Shivratna and using it for spiritual purposes ensures the wearer a better physical and mental health.